Demonstrations intensified and a government crackdown continued on Thursday despite attempts by the Syrian regime to reclaim the reform agenda and boost its international credibility. Activists dismissed the moves as a public relations campaign as the army swept through villages in the north-western province of Idleb. Tanks entered the villages of Ihsim and forces were gathered close to several other villages in the district of Jebel Zawiya, activists reported. Ten people have been killed since Wednesday in the border area despite a report by Syrian state media agency Sana earlier this week that the army operation in the area had finished. 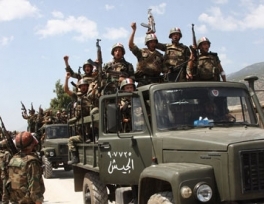 Earlier Sana said the army was chasing terrorists who the government claims killed 120 security agents in Jisr al-Shughour on 6 June, but activists insist troops are looking for army defectors. Meanwhile, gunfire was reported in the southern city of Deraa, according to the Local Co-ordination Committees. A resident of Deraa said that for residents of the city "the regime has fallen". But she said the situation remained tense with army and security forces in control and curfews from 2pm to 5pm and from 10pm until the morning. Elsewhere peaceful protests are being allowed. Army and security forces have withdrawn from the city of Hama, south of Aleppo, according to residents who described it as having been "liberated" for more than two weeks. "There are currently no posters of the president, no security forces and no checkpoints," said one young woman. More than 70 protesters were killed in Hama, Syria's fourth most populous city, on 4 June. Two members of the security forces were killed by angry mourners at the funerals that followed. Wissam Tarif, of the human rights group Insan, claims the forces have withdrawn because they are overstretched. 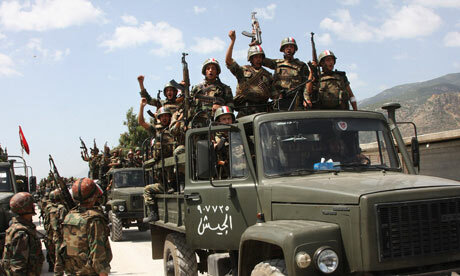 Syria's army is weak by regional standards and experts say it would struggle to cope with simultaneous mass uprisings. But some commentators suggest Hama is being left as the government tries to calm the situation before dialogue and as international condemnation has grown. Any crackdown would be likely to inflame a city deeply scarred by a previous crackdown in the 1980s. In the face of an Islamist uprising the government of then-president Hafez al-Assad launched a brutal army assault on Hama which killed at least 20,000 people, many of them civilians. "But leaving the city for good is not a solution because huge protests now go on every night," said one resident. Protests appear to be growing outside Hama too. A group of 300 lawyers protested outside the palace of justice in Aleppo, the northern commercial hub which has remained relatively quiet. Demonstrations were reported in at least three areas of the city on Thursday after the Syrian Revolution 2011 Facebook page called for 1 million people to come out. Protests also took place in Raqqa, a largely Bedouin city in the centre of the country. On Wednesday the US treasury added new people to its list of sanctions on Syria, including head of the air force intelligence chief Major General Jamil Hassan.